How and why the agricultural machinery equipment sector still has upside potential. It's no secret that companies such as Deere & Company (NYSE:DE) and Caterpillar Inc. (NYSE:CAT) have cyclical earnings. Their revenue tends to experience peaks and troughs, and they don't necessarily align with the economy at large. The fear with Deere (and with Caterpillar) is that the uptick in the past couple of years will mark a local peak, and no one really feels comfortable buying a stock whose growth has peaked. That said, all cycles are different, and I think there could be more room to run with Deere. Here's why. The typical agricultural machinery equipment cycle is led by crop prices that can fluctuate significantly. Weather obviously plays a large factor in moving crop prices around -- bad weather tends to reduce crop yields and therefore raise crop prices -- but there's also the usual agricultural business cycle to consider. This works in terms of high prices that cause farmers to plant more crops, leading to increased harvests that then cause lower prices in the next period. Now that prices are lower, farmers tend to reduce planting, or switch to another crop where they can, and the reduced harvest causes higher prices. Then the cycle begins again. 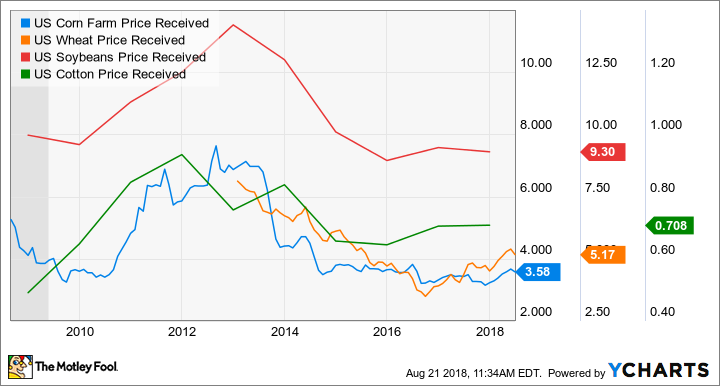 Of course, the impact on movements in crop prices, and specifically farm cash receipts, for agricultural machinery companies like Deere is significant. Indeed, every single earnings conference call from Deere contains a chart and a forecast for U.S. farm cash receipts -- the U.S. is Deere's core market. But here's the key point. Deere is managing to increase revenue and profitability even as U.S. farm cash income has flat-lined in recent years and global crop prices remain weak. No matter. Deere is still growing. But how? On the recent third-quarter earnings call, management outlined two key points regarding its agricultural equipment end markets. First, "in agricultural markets, replacement demand continues to drive sales activity for large equipment," according to Manager of Investor Communications Brent Norwood. Second, demand for replacement equipment has been accompanied by farmers' showing "continued willingness to invest in technologies that enhance operational efficiencies and produce tangible economic results," according to CFO Raj Kalathur. In a nutshell, the replacement demand cycle has given Deere an opportunity to drive sales of its advanced technological solutions. These products include things such as telematics, precision hardware, spraying technology, digital solutions, and customer support. Take-up rates appear to be very high, with President of Agricultural Solutions John May saying that "recent precision hardware solutions" have achieved "take rates in excess of 50%" in some cases. In Deere's construction and forestry segment, management cited a raft of U.S. construction industry indicators that are looking more positive than they did three months ago. 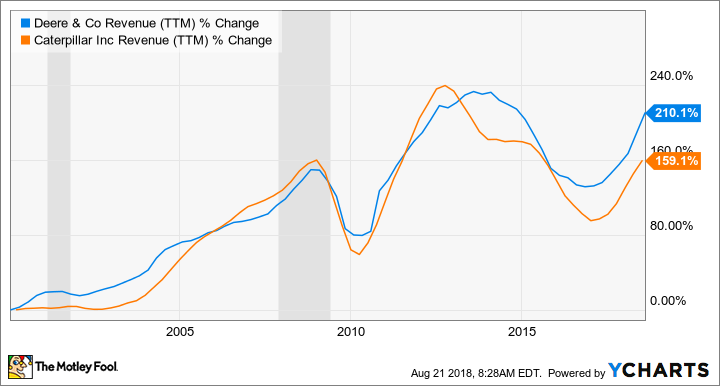 For example, U.S. total construction investment in the U.S. is now expected to grow by 3.8% in 2018, compared with a previous estimate of 2.9%. That's also good news for Caterpillar, and it's worth noting that Caterpillar's management believes it's still in the early innings of an upcycle in mining machinery spending. Deere would benefit from rising crop prices. Image source: Getty Images. Looking ahead, analysts have Deere's sales growing at 7.2% in 2019. Although management pointed out that it was too early to draw any firm conclusions about next year, May also pointed out that its early order programs were ahead of last year's, despite some uncertainty around any potential escalation in trade conflict. Similarly, "we feel good about the continued replacement demand that we are seeing drive technology adoption," according to Director of Investor Relations Josh Jepsen. In other words, Deere has good underlying demand from the replacement cycle and take-up of its technological solutions in agricultural equipment, while construction demand remains good. If this is accompanied by any kind pickup in crop prices -- inclement weather could help -- and if farm income improves, then there is upside to analyst estimates. Deere's cycle may well have further to run.